The exhibition Still I Rise: Feminisms, Gender, Resistance, on show at Nottingham Contemporary (until 27 January 2019) could not be more timely. The curators behind the two-part show focus on the role that women have played in the history of resistance movements worldwide, touching on Black Lives Matter, the Women’s Liberation Movement and Latin American dictatorships. Against the backdrop of the #MeToo movement, and the rise of President Donald J. Trump, the show takes on extra resonance. We asked the exhibition curators to select key works (part two of the show opens at the De La Warr pavilion in Bexhill-on-Sea next year, 9 February-2 June 2019). My pick is Carolina Caycedo’s new work, which is titled My Feminine Lineage of Environmental Struggle (2018). 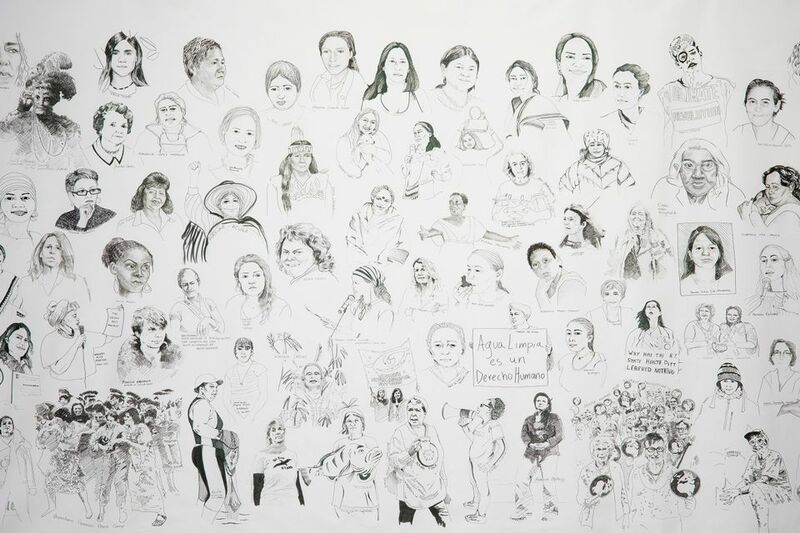 This work was made specially for the exhibition and gathers the portraits of over 100 women eco activists. This work is very significant for the exhibition as it traces the important role women have played in resistance movements against the destruction of the environment and for the right to access to land and natural resources by indigenous and local communities across the world. It also highlights the violent opposition eco activists are subjected to by large corporations, governments and other oppressive bodies. Many of these women have been incarcerated, assassinated or live under threats. Faith Ringgold’s Marlon Riggs: Tongues Untied (1994) embodies the complexities we wanted to make more prominent in dealing with feminisms, resistance and gender through the prism of intersectionality, which we used as a matter and a method. In this work, Ringgold pays tribute to Marlon Riggs (1957-94), an Afro-American gay rights activist and filmmaker known for his film Tongues Untied (1989), which explores the revolutionary potential of black gay desire and love. 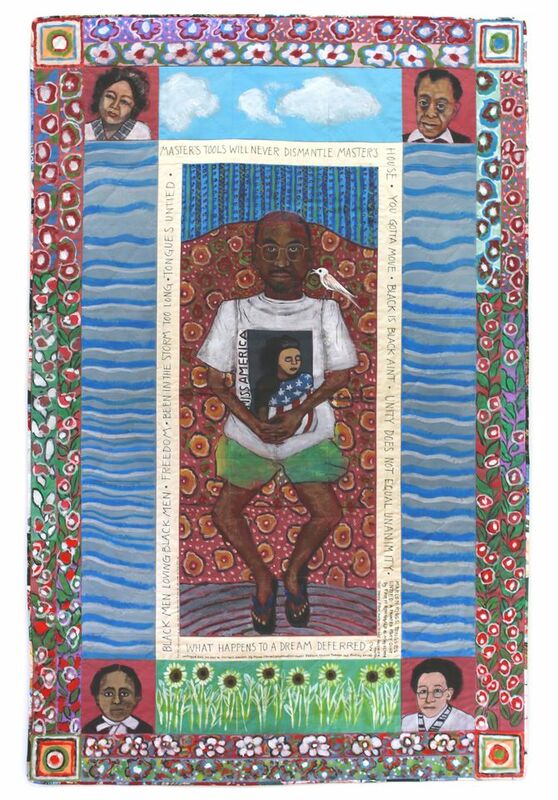 This work also places Riggs amongst a great array of black feminist and queer thinkers: James Baldwin, Audre Lorde and Harriet Tubman (each occupying a corner of Riggs’ simili-sarcophagus through their portraits and words). In addition to them, is Riggs’ grandmother. I find the creation of this imaginary lineage very compelling and telling of Still I Rise’s ambitions to weave different stories and histories together, careful to treat intimate gestures and collective efforts on the same plane. Last but not least, I am very triggered by the direct reference to Lyle Ashton Harris’s Miss America (1987-88) on Riggs’ T-shirt, which complicates even more, the racial and gender dynamics at play in this work. Tai Shani’s Semiramis (2014-18) is an epic project that the artist has been developing over the last four years. It has taken the form of installation, performance, moving image and text, using Christina de Pizan’s 1405 text The Book of the City of Ladies as a starting point to consider how the meshing of past, present and future can help to propose and rehearse new realities. For me, this work illuminates the importance of fiction, and how storytelling has for centuries been a vital way for feminist (or proto-feminist) thinkers to rehearse potential futures, to deepen empathy, and to interrupt systems of power that define how we should live, speak and relate to one another.